Home » British Women’s Success Stories Are Not Being Told. It’s Time To Rectify That. British Women’s Success Stories Are Not Being Told. It’s Time To Rectify That. In a recent British Surf Broadcast, documenting surfer’s success stories so far this year, I couldn’t escape noticing that alongside the nine male surfers mentioned, there was only one female. And rightly so that young Ellie Turner was included, Ellie has been pushing the standards of British female surfing and continues to endlessly amaze me with the strength and skill of her surfing. The only other two female nods were a pregnant partner and a wife. I can’t help but feel that there must be more female success stories out there that we just aren’t seeing. Ellie Turner and a world class backhand re-entry in Bali. We are women, we are here. We make up half the global population, and 40% of all athletes. Even in surfing, we are not a minority, with an estimated 2 women surfing to every 8 men. So why do we only make up on average 4% of media coverage? It’s worth noting though that surfing is ahead of many other professional sports in terms of a gender balance in access, funding and prize purses, so why do our stories tend to remain niche? I spoke to Wavelength Magazine about the representation, or lack of, women in this particular broadcast and they explained that they had checked out all the contest results and couldn’t see any other significant stand outs other than Ellie, and seeing as this was a story solely about big waves and competition, they couldn’t find anyone else to include. It got me thinking about versions of success. Newquay based photographer and stylist Evie Johnstone’s work is everywhere you look at the moment. She still manages to squeeze in yearly trips to the tropics though, where she usually ends up on the other side of the lens. Here she lays into an unsuspecting Mexican wall. Photo Antonio Russo. Success is a vague concept to begin with, but from a masculine perspective- the perspective that is running the majority of media we are seeing- it’s riding big waves and winning contests. But are these really the only forms of success? And if so, is this narrow view of success always beneficial? These types of success stories serve to support male superiority in publicly acclaimed skills, which in turn leads to the inferiorisation of women and their skills. The relationship between sport and gender inequality is complex, but its evident that sport contributes to male dominance in general, not just the perpetuation of surfings own unequal structure. Men and women are different in many ways, men are on average 50% stronger in brute strength, but I’m sure I’m not alone in feeling strength isn’t the only desirable trait we should aspire to. There are lots of other versions of success that could be told and so many other inspiring stories along the way. One of the big hurdles is that only 7% of stories in sport are written by women, and 81% of all quotes mentioned in sporting stories are the voices of men. Sexism doesn’t have to be deliberate to exist. Evidence suggests that men and women cover stories differently, so it seems to me the simple antidote to this male heavy focus in sport is fairly obvious, have women tell the stories too. Get some feminine perspective. Sexism doesn’t belong in sport. It doesn’t belong anywhere. Ensuring a diverse set of voices are being represented can help lead the way to a more healthy sporting culture, both in the media and in the water. Increasing the visibility will also increase the accessibility, and by showing women and telling their stories, we can inspire more girls and women to take to the surf. Maybe one day we will see 1:1 not only in the water but in the films and magazines too. Perspective matters. If we change the narrative a little, the women’s success stories from this year could be a lot more diverse than exclusively Ellie’s triumphs. Take for instance Charlotte Banfield, a 19 year old surfer from Cornwall who has autism, cerebral palsy and a heart condition, but not even a seizure in the water during her heat could stop her from collecting a silver medal for England in the World Adaptive Surf Championships in California last winter. If you haven’t seen it, check out the video of the final and how humble and stoked Charlotte is when she declares she caught her first ever green wave in the World Finals. Charlottes also successfully managed to keep her head down in her studies whilst she’s not in the water and has just completed her final year studying Marine Biology at Falmouth University. With a busy year now ahead, Charlotte has not only been selected to compete on the English Team this year at the Europeans in September, but she has also been invited to compete in the the USA open in October, The Dukes Access Surf Adaptive Surf Championships in Hawai’i, and the Stance ISA World Adaptive Surfing Championship in December. Tassy training up one of her Surf Ratz for those big drops. Tassy Swallow, professional surfer and multiple time British and English Champion, may not need such an introduction, but what you may not know is that while Tassy may not have won any big titles this year, her focus has been elsewhere with the official launch of SurfHouse St Ives in the pipeline for this September. Tassy knows competing isn’t for everybody, but believes there’s so much more to be got out of the sport, which is why she started Surf Ratz in 2012. Her aim not to create just another surf school, but a social project to help girls and other young people achieve their full potential as strong, confident, resilient and independent people with their own life ambitions and goals. Surf Ratz was so successful that Tassy went on to secure a long lease from Cornwall Council on a derelict site with sea views in St Ives, was granted planning permission to restore the building to provide a home for the Surf Ratz project and education facilities, and then successfully crowd funded the project from the public. Through SurfHouse St Ives Tassy’s focus is now on collaborating with local schools, social services, children’s care providers and even doctors’ surgeries, to broaden the range of girls and young women for whom surfing can benefit mentally and physically, including those who are vulnerable, have disabilities or come from low income households. 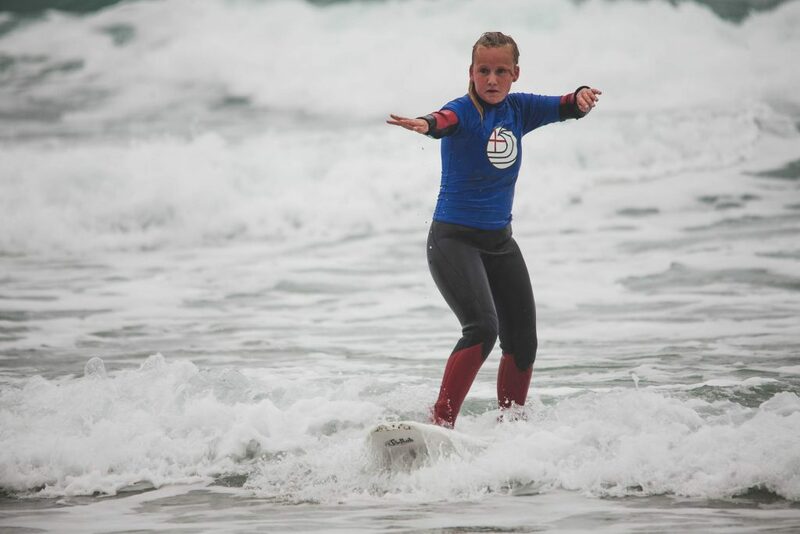 The SurfHouse St Ives project is using surfing as a vehicle to help young girls develop their self-confidence, a positive body image, and a strong sense of their individual identity during this important stage of their lives. That seems like a pretty important, needed and successful project to me. Hannah Harding and I met in Indonesia years and years ago, and became friends as the only two girlfriends that surfed who could handle extended periods of time in cockroach infested non air conditioned rooms way before Bali got infinity pools and wifi. Hannah is former English Surfing Champion and now full time mum to our favourite instagram star Reggie. Reggie suffered a stoke at birth and the damage resulted in cerebral palsy and a visual impairment. A lot has changed since our days at Lakey Peak, and Hannah has taken on the daunting journey with endless love and positivity. Hannah, like her son, is a determined soul, and is currently on a mission to improve Reggie’s quality of life. Hannah is aiming to raise £12,000 to fund CIMT (constraint induced movement therapy), the expected outcome is huge, building Reggie’s self confidence, remapping his brain and building new muscle memory. CIMT is not available on the NHS so I hope this crowd funding is as successful as Tassy’s. During her pregnancy Hannah was raising awareness for pre- natal health, and she now promotes a healthy surf motherhood lifestyle, getting in the surf (and surfing better than most) whenever she can, and still finding the time to volunteer as an ambassador for the Wave Project charity, which runs surf courses for socially isolated children. Sarah Bentley, former British Team surfer and founder of sales agency FOAM is going from strength to strength, representing exciting brands from the likes of British-made Wanderlust Life to Vans, getting them in front of the right people and managing to surf whenever the waves are good. Sarah attributes all of the success in her business life to surfing, enabling her to have the confidence, creativity and community go self employed. Sarah also has two sons, 11 & 5, and now Luca has started surfing too there will be even more water time for their little family. And lets not forget Andrea Lawrence, who at 46 with a neck injury, is having a good go at the competitions, and just got her best result yet with a silver behind Jenny Pendlebury in the English National Women’s Masters (+35’s), proving you don’t have to be 16 or surfing all your life to enjoy surfing and even take home a sneaky medal every now and then. If these women aren’t examples of success, I don’t know what is. Not only resilient & strong, but creative, loving, caring, supportive and many other distinguishing characteristics, whilst all ripping in the water too. I’d want to raise my sons and daughters to be like these people. I feel the well rounded success stories have not only medals in the cabinet but strong moral values, integrity and positive impact. The success stories to me are the ones creating something bigger than just one person. These are just a small handful of all the stories I could have included, but I hope they show success doesn’t have to be all big waves and competitions. All we need is a little more feminine perspective. Looking for more thought-provoking surf stories? Grab a copy of Issue 254 or subscribe now. It’s the perfect gift for yourself or the discerning surfer in your life.